Today we are doing a quick site audit for one of our Shopper Approved customers called Mineral Tiles, a glass tile backsplash company based out of … hmmm, there’s no address. Okay, that’s the 1st recommendation. As a person whose going to put down an American Express card, I to know if this a USA, Australian, or Chinese company. I don’t mind if the company is all the way across the country. If I did, then I would type in the name of my city like “San Diego glass tile backsplash”. … it is working. Great tool! better than anything I’ve tested before. I’m going to use one of their product pages as an example: https://www.mineraltiles.com/glass-mosaic-tile-contemporary-brown/. One thing many people look at are product reviews. 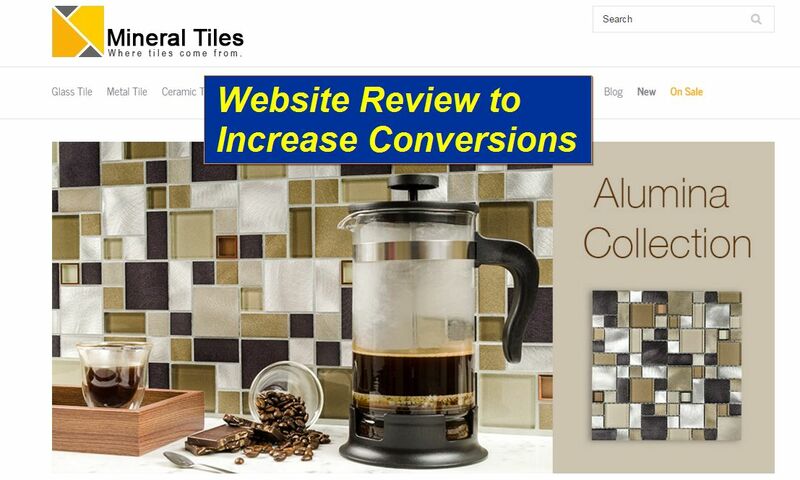 A great eye catcher would be if mineraltiles.com had organic stars (see image 1) in addition to their Adwords star ratings. The credibility starts before a visitor gets to your site. Getting product reviews for Henry’s site would be easy since all his customers are already leaving all kinds of merchant reviews. If Henry got Shopper Approved’s Product Reviews, the ratings will show up in Google, Bing, and Yahoo organic. In addition, they will show in Google Shopping, which is WAY cheaper than Adwords CPC. Once a visitor makes it to the product page, you can see 1 review from 09/30/14. It’s a 4 star review, but that’s better than no review. If Henry had 10 recent product reviews, this page would be making more sales. The problem MANY ecommerce companies have is getting reviews for individual products. They are simply too busy running the company. Even though he is using Yotpo product reviews (a good yet expensive company) for the reviews, maybe it’s not easy for the customer to leave a product review like it is for Shopper Approved Product Reviews; it’s just an extra question on the SA survey. Going into the shopping cart. Having some type of security badge is often overlooked by ecommerce companies. It’s good to see they have one. Normally these are called Trust Seals. These are good ways to help increase conversions by building confidence for people who have never shopped on the site. A strong alternative is Trust Guard which has Security Scanning Seals, Privacy Seals, & Verified Business Seals. Overall the site is easy to use. With more product reviews (on the product page, Google Shopping and Google organic), I think conversions can increase fast because it builds credibility. Amazon has been doing this for years. In fact, Ebay and Amazon’s business was built off customers’ product reviews. If you are one of our Shopper Approved customers and want your site audited, let us know in the comments below.